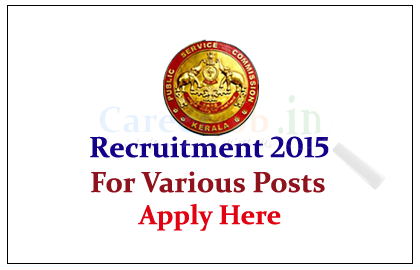 Kerala Public Service Commission is recruiting for the post of Divisional accountant/ Lecturer / Jr. health Inspector / Cook. Eligible candidate can apply online on or before 1st July 2015. Public works department in the State of Travancore (which later formed the major part of Kerala State following the reorganisation of states in 1956) made its beginning in the year 1823 with the formation of the Maramath Department as a branch of the Huzur Cutchery (Government Secretariat) with an executive branch known as the Panivakai Maramath. Interested and eligible candidate can apply online on or before 01.07.2015, for more details kindly check official notification.